The River Bakery in TamworthRecord Owner? Log in. Exit 579 on the 401 and drive 25 km. north on Hwy 41. Turn right (east) on Hwy 4 and drive 5 km. into Tamworth. Or come up 20 km. from Camden East on Hwy 4. Eat In Take Out. CLOSED MONDAYS AND TUESDAYS, Wednesdays and Thursdays. 8am - 4 pm. Friday & Saturday 8am - 6 pm. Sundays 8am - 4 pm. Catering for all occasions available. Cafe and patio seating. Lots of parking. Have something to say about The River Bakery in Tamworth? My family and I went to the River Bakery Cafe today. It was such a wonderful experience! The staff was absolutely delightful and the variety of baked goods we ordered were some of the best we’ve ever had! What a great little spot! We highly recommend! I often frequent this little bakery on road trips that take me north on Hwy 41 as it is a short 10 minute detour off the highway. It is a great little spot to stop for lunch to break up the drive to the Ottawa Valley or to Land O Lakes cottage country. Stop in for breakfast or lunch for a sandwich and pick up some bread, baked goods, specialty mustards or sweet treats for the weekend at the cottage. The bakery itself is quite small, with limited indoor seating but there is a lovely outdoor patio. The staff is friendly and they are always eager to please. They offer a Friday pork ribs by the pound special; the recipe changes weekly. The sausage rolls are the best I have ever had, in fact I have from time to time special ordered large quantities to use for parties at home. We were travelling between Kingston and Peterborough this past weekend. Not sure how we came to be passing through Tamworth on an early Saturday evening but the back roads will take you anywhere. We ended up stopping at the Bakery for dinner. What a great decision. A very friendly atmosphere with patrons and staff and the food and service were exceptional. Everything was fresh, wholesome and tasty. Far more than we would have expected for what seemed to look like, in the dark, such a small town. The Bakery will be a planned stop en route between Peterborough and any where east. Thank you for making us feel welcome. 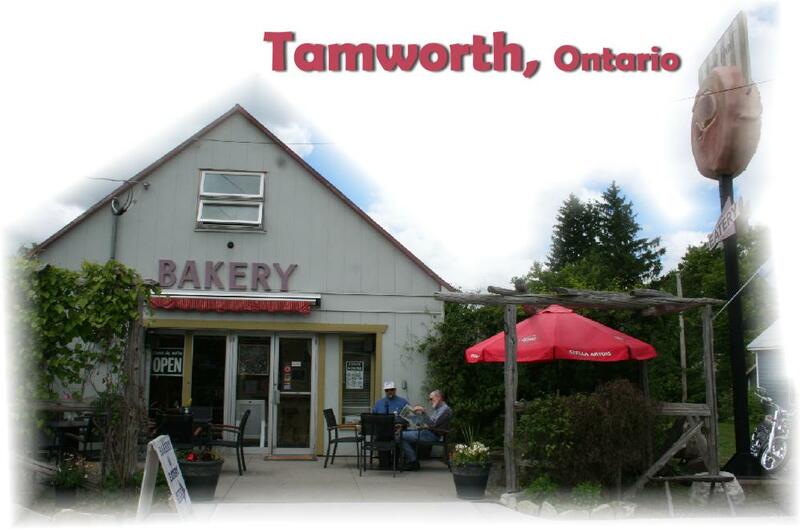 The trip up towards Bon Echo park would not be complete without a sidetrip to the Bakery!! For years, I have enjoyed the hearty soup that accompanies those mile-high sandwiches. My only wish is that they were closer - but going there is definitely an event and one to cherish every time.